Stratégies concertées de lutte contre les mutilations génitales féminines > Members' publications > Ending Female Genital Mutilation: Where do we stand in Europe? 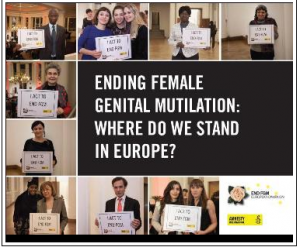 END FGM EUROPEAN CAMPAINGN, Ending Female Genital Mutilation: where do we stand in Europe?, Amnesty International, 2013. The END FGM European Campaign released its latest publication which provides an update on the situation in Europe in relation to the practice of female genital mutilation. Itconsolidates the knowledge and commitments gathered by the Campaign through its Art for Action tour which ended in February 2013. At the finale of the Art for Action tour in Brussels, the Campaign brought together the art creations with the commitments of EU decision makers from each tour stop. Each tour created a space for discussions on how the practice of female genital mutilation can be ended and women’s and girls’ rights can be protected. This publication features an infographic with key facts, quotes from the speakers, descriptions of promising practices in Europe and recommendations for Europe to act against FGM.